Labor populist politics or a big policy gamble? What does Bill Shorten’s proposal to remove the refund on excess franking credits mean? We have had several enquiries from clients wondering what this all means, so we have put together an overview of the key issues to explain how this could affect you. Firstly, it is important to point out that these changes are only ‘proposals’ made by Bill Shorten, the leader of the opposition party, and are evolving as the party gauges how popular the proposals are with the Labor constituents and the general public. To affect change, Labor would need to win the next election, and be in a strong enough position to successfully get the changes passed through the House of Representatives and the Parliament by majority vote. Outside the possibility of a double dissolution, the next election must be held between 4 August 2018 and 18 May 2019, so it is likely that the details and complexities of this policy will be hotly debated by both parties as they attempt to increase their numbers in the polls. This is a policy that proposes to take away a tax refund that mostly benefits people (and/or their super funds) in the lowest tax brackets (see the first two tax brackets in Table 1.). So, it will be tough for Labor to maintain the argument that the reason for the proposal is because low income earners are being disadvantaged by the wealthy elite who are getting more tax refunds than they are. There are a lot of complexities behind all this, so be prepared to hear more debates and conflicting information from both sides of politics and the media. The Medicare levy of 2% (legislation pending to increase this to 2.5%). The low-income levy, which effectively increases the tax-free threshold to $20,543. 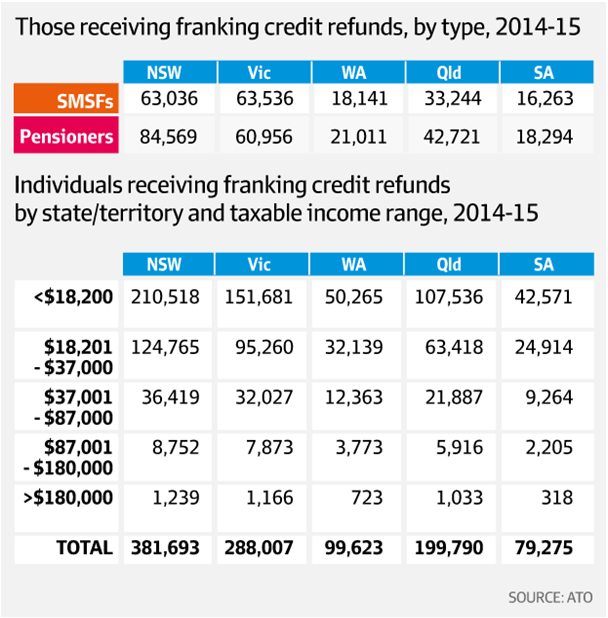 However, you can see in the top section of Table 2. below, that in the 2014-2015 year there were large numbers of SMSFs and Pensioners across every state of Australia benefiting from the tax refunds from excess franking credits. Australia is very unique in the way it refunds taxes on dividends and provides tax-free income streams for retirees in superannuation. No other country in the world provides this benefit. The Labor Government will argue that this combination of benefits is creating an increasingly larger group of wealthy seniors who are spending longer periods of time paying no tax as their life expectancies increase. Official figures show that the proportion of older Australians paying no income tax has increased from 73% in 1995 to 84% in 2014, and is growing. These are issues that the Government will need to address whoever is in power. In summary, those affected by Labor’s proposals would include a relatively small number of people on the Full Age Pension, a slightly larger number of people on Part-Pensions and then the Self-Funded Retirees (drawing tax-free super pensions). Many of our clients in these categories stand to lose what has become a significant supplement to their income, ranging from hundreds, thousands to tens of thousands of dollars a year. To soften the original announcement, Labor have also announced that low-income retirees will now be excluded from the franking credit crackdown as will SMSFs with at least one Age Pensioner (or Centrelink allowance recipient) before 28 March this year. The problem with this approach is the that those SMSF retirees who did not qualify for the Age Pension before 28 March 2018, will not be able to access the same level of Age Pension entitlements to supplement their superannuation incomes, creating an unfair, two-tiered and complex system for SMSF members and superannuation going forward. The bottom section of Table 2. below shows that the two lowest income brackets for Individuals ($0 – $18,200 and $18,201 – $37,000) make up 86% of those that qualify for the excess franking credits refunds. This highlights that low income earning individuals are mostly those receiving some kind of benefit from the refund of excess franking credits. What are franking credits and dividend imputation? A portion of Fintech’s diversified portfolios are invested in Australian shares, which benefit from some franked dividend income. Dividends are the amounts paid out from those Australian shares using profits that the companies have made during the year and often come with an imputation or franking credit attached. Dividends are grouped together with any other income or earnings you make during a financial year to determine your overall taxable income. When a large company earns a profit, it is required to pay tax on that money at the corporate tax rate of 30%. Before the dividend imputation system was introduced in 1987 by the Hawke/Keating government, the tax office would firstly tax the company, and then secondly the investor when they received the dividend, in effect a form of double taxation. Since the introduction of the dividend imputation (or franking credit) system, when you have received a dividend from an Australian share in your portfolio, you have only been taxed on the difference between the company tax rate of 30% already paid and your marginal tax rate. If your Individual tax rate was at the highest level of 47% (inc 2% Medicare Levy), then you would pay tax at 17%, the difference between your tax rate of 47% and the 30% franking credit for the company tax already paid. Conversely, if your Individual tax rate was 30%, then you would not pay any tax on dividend income received, as it would be offset completely by the 30% franking credit for the company tax already paid. Refunding of excess franking credits – If your tax rate was 0% (same as the tax-free pension phase in super), the you would be eligible for a refund of the excess franking credit. That is, the entire 30% company tax paid is added back to your income as a credit, creating a tax refund. This has made owning ‘blue chip’ Australian shares paying dividends with imputation or franking credits a powerful strategy, especially for investors whose marginal tax rates are less than the corporate tax rate of 30%. Since the year 2000, when the Howard/Costello Government made excess franking credits fully refundable, the cost to the federal budget has ballooned to about $5.6 billion a year, and growing. Table 3. below provides a comparison of the impact of Labor’s plan to end cash refunds for unused or excess franking credits across three different investor structures. The refunding of excess franking credits has been particularly beneficial for members of superannuation funds or SMSFs that are in tax-free pension mode (over age 60 and fully retired), as it has added approximately 1.71% per annum to the after-tax return. A benefit of approximately 1.33% in additional returns applies to Individuals who own Australian shares with franking credits and have no other earnings in their own names, as they are also on a 0% tax rate. The Turnbull government will argue that on 1 July 2017, it introduced the $1.6 million limit on the amount of money that can flow tax free from pensions in super (Transfer Balance Cap), which has already curbed some of the costs of super concessions. Under the new rules, SMSF members with more than $1.6 million will be paying tax on some of their earnings that will offset the value of their franking credits, limiting their refunds. 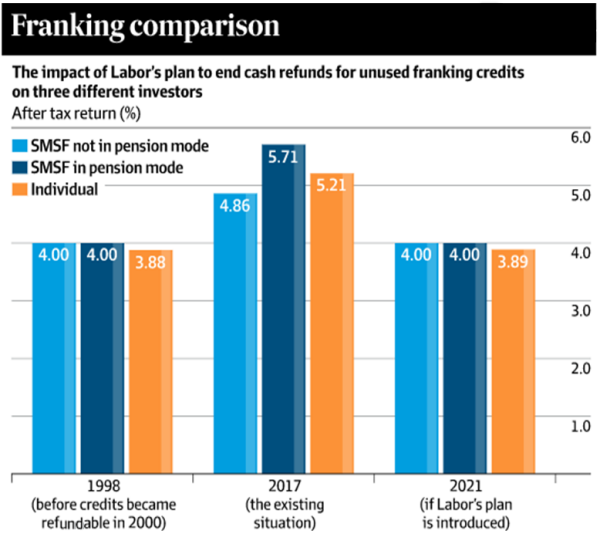 It will be very interesting to see whether Shorten’s radical policy announcements to remove the refund on excess franking credits will have enough appeal to the tradition Labor heartland or become a big policy mistake. There may be enough weight with disgruntled self-funded retirees to garner support and momentum for the Turnbull Government to win a second term and continue implementing the existing policies that only came into effect from 1 July 2017. Please contact our office if you wish to discuss any of the above in relation to your specific circumstances. https://www.fintech.com.au/wp-content/uploads/2018/03/bill-shorten.jpg 619 794 Jay https://www.fintech.com.au/wp-content/uploads/2017/08/Fintech_Primary-Portrait@2x-300x300.png Jay2018-03-30 16:53:202018-03-30 16:53:20Labor populist politics or a big policy gamble? A local SMSF Accounting professional covering Queensland is in the running to take out one of Australia’s most coveted SMSF awards. Keersten Plep has been shortlisted as a finalist in the SMSF Specialist Accountant of the Year category at the state-based 2017 SMSF and Accounting Awards hosted by SMSF Adviser, Australia’s top publication for SMSF professionals. The inaugural SMSF and Accounting Awards will recognise individuals and businesses that are making their mark in SMSF and accounting advice by championing professionalism, quality advice and innovation. 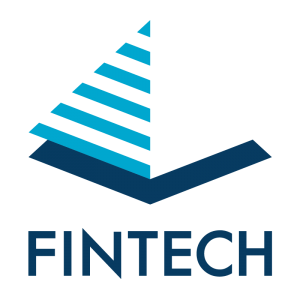 Founded in 1987, Fintech offers integrated financial solutions to the Queensland community. It has particularly strong relationships with [appropriate network] and specialises in financial strategy and advice, investment management and SMSF Accounting. Manager editor of SMSF and Accounting, Katarina Taurian, said that the winners “represent a cross-section of this state’s outstanding professional talent, pointing to an absolute dedication to delivering specialist, unique advice to a burgeoning client base”. “Some top-performing firms and professionals are focused on doing business in their home states and locales, and we are excited to acknowledge the unique excellence and expertise they are bringing to their client base,” she said. Grant Chapman, Principal at Fintech said he is humbled by the nomination. “That Fintech has been recognised for its excellent contribution to the SMSF Accounting industry reinforces the strength of our brand in connecting with our target market and customers,” he added. The winners will be announced at a gala dinner at Brisbane Convention and Exhibition Centre in Brisbane on Thursday, 26th October. Sound confusing? Well it is quite complex, as there are a number of ways the changes can be applied depending on your circumstances. Let me explain. On 15 September 2016, Treasurer Scott Morrison and Minister for Revenue and Financial Services Kelly Dwyer announced significant changes to the largely unpopular superannuation reforms proposed on Federal Budget night in May this year. From 1 July 2017, there will be a new annual Non-Concessional Contribution cap of $100,000 (reduced from the current annual cap of $180,000) and if you are under the age of 65, you will still be able to use the ‘2 year bring-forward’ rules going forward.This means that if you are under age 65 and have not triggered the NCC bring forward cap by contributing over $180,000 in any of the past 3 financial years, you can contribute up to $540,000 for the last time this financial year (before 30 June 2017). From 1 July 2017, only those with a superannuation account balance below $1.6 million (assessed as at the previous 30 June) will be able to make Non-Concessional Contributions. Importantly, if your individual super balances are close to, or already exceed $1.6 million, this represents a final opportunity to make NCCs up to $540,000 each (3 x $180,000) utilising the ‘2 year bring-forward’ rules before 30 June 2017.And from 1 July 2017, based on the current information available, if you have less than $1.6 million in super as at the prior 30 June, but more than $1.5 million, you can still contribute a total amount of $100,000 as a Non-Concessional Contribution (not just the shortfall to the $1.6 million total). The Government will retain the existing requirement that you must meet the ‘work test’ to be able to contribute to super between ages 65 and 74 (they had originally proposed to remove this requirement).This is a disadvantage for those in the 65 to 74 age bracket who have funds to contribute to super but cannot meet the work test rules (i.e. being gainfully employed on at least a part time basis for 40 hours in a 30 day period, during the financial year in which contributions are made). There are no changes to the proposals around tax-deductible Concessional Contributions (including lowering the cap from $35,000 to $25,000 per annum) other than delaying the “catch-up” opportunity for those with less than $500,000 in super by 12 months to a 1 July 2018 commencement. Where an individual has triggered the bring forward in 2015-2016 or 2016-2017 but has not used it fully by 30 June 2017, transitional rules will apply. Where an individual triggers the bring forward in 2016-2017, the transitional cap is $380,000 (the current annual cap of $180,000 plus $100,000 annual cap in 2017-2018 and 2018-2019). See examples 1 and 2 in the table below. If an individual triggers the bring forward in 2015-2016, the transitional cap is $460,000 (the current annual cap of $180,000 in 2015-2016 and 2016-2017 plus $100,000 annual cap in 2017-2018). See example 3 in the table below. Individuals are unable to make further NCCs where their total superannuation balance is $1.6 million or more (tested at 30 June of previous financial year). Where an individual’s balance is close to $1.6 million, they can only make a contribution or use the bring forward to take their balance to $1.6 million but not beyond. It’s important to be aware these proposed changes are not yet law but are expected to be introduced into Parliament by the end of 2016. There is likely to be a consultation draft released prior to that time which is expected to have more detail on the changes. If you would like more information, click on the following link to the Government’s Superannuation Reform Fact Sheet: http://www.treasury.gov.au/Policy-Topics/SuperannuationAndRetirement/Superannuation-Reforms. In the meantime, if you have any questions contact our office on telephone 07 3252 7665.